Just a record on a recent turbulence in the currency market. 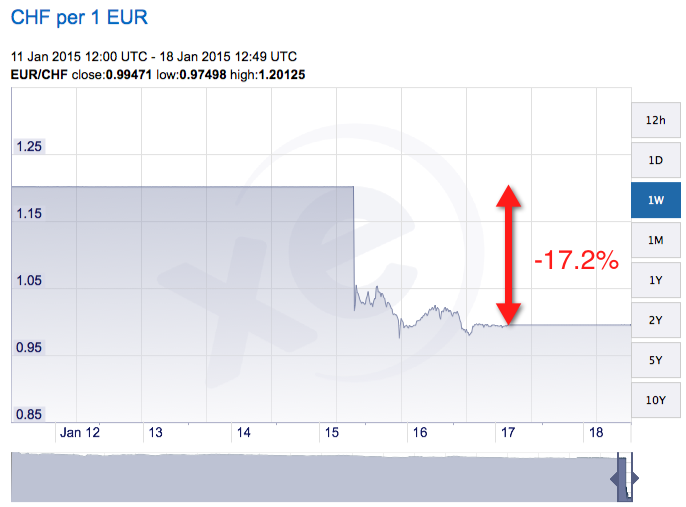 SNB (Swiss National Bank) decided to remove the peg of its currency (Swiss) with Euro. Such a decision not only ruined Swiss’s reputation and its credibility to keep its cap on Euro, it also caused its country’s stocks to tank (everything becomes more expensive). Foreigners who get loans from Swiss bank suddenly owe 17% more in debt. Of course, whenever there are losers, there are winners. Those who own Swiss assets will find their net worth increase by same amount. I got an email from OANDA (Foreign Exchange Broker) on 16 January 2015 about this incident. It kept me busy the whole weekends trying to dig out every news regarding the future of Euro. Early on January 15, 2015, the Swiss National Bank (SNB) sent global financial markets into turmoil with a surprise move to eliminate its three-year-old cap on the franc (CHF). In the wake of this unprecedented market event, OANDA demonstrated its ongoing commitment to doing right by its clients. Despite suffering losses and vanishing liquidity in the institutional hedging market, OANDA remained true to its 14-year legacy of transparency, integrity and fairness to our clients. OANDA did not re-quote or amend any CHF cross client trades. We even took the further step of forgiving all negative client balances that were caused when clients could not close out their positions fast enough (where permitted by regulations). 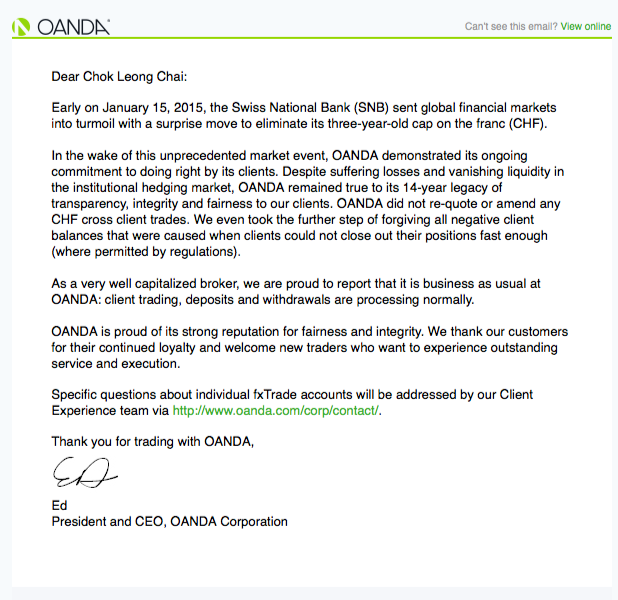 As a very well capitalized broker, we are proud to report that it is business as usual at OANDA: client trading, deposits and withdrawals are processing normally. OANDA rocks in putting its clients first. A sudden change of such magnitude bankrupted a few Forex brokers (e.g. Alpari UK). This makes me wander how fragile the highly leveraged financial markets are. Well, this definitely is not the end of the shock given that Greece is having election on 25 January 2015 which might bring the Euro crisis back. If the election is not conclusive, then there will be another election in March. This article explains the Euro Crisis well: 9 facts about the Eurozone crisis. The summary is that the Eurozone was created to prevent world wars but not for economical purposes because it makes no economical sense. There are more details in the article. My take on the topic is that Eurozone is more like a communist zone where there is a central planner of the economy which decides the interest rate for all its members and created today’s problem. Using top-down approach in a very large centralized organization (like Eurozone) is a very challenging task because of its rigidity. Thing tends to fail catastrophically if it grows too large, like dinosaur. This is the weakness of a centralized system where one thing fails the whole system fails. Greece is a relatively small country in Eurozone but its failure can drag down the whole countries in the zone. If Internet is designed in such a way, it couldn’t have survive. This is the power of distributed and decentralized system where a server down wouldn’t bring much a trouble to the whole network. Of course, everything has two sides. Its strength can be its weakness. Life is hard. Side note: This makes me worry that the convergence that we are having in our the company might someday become a trouble too. There is a lot of unknowns in the market. Together with the low oil price environment, where is the next place to invest? By the way, Malaysia was listed among the worst performing stock markets in 2014 by Telegraph.co.uk. Cycles are everywhere in the markets. Those at the top fall while those at the bottom rise. During the 2008 crisis, USD was weak. Fast-forward to 2015, the USD is getting strong while AUD, MYR, JPY etc are beaten down. Stay the course, keep invested. This entry was posted in Investment and tagged Finance on January 18, 2015 by Chok Leong.